A capture of an "All-American," lesbian Family. Allow me to introduce you to our normal. We arrived home from the hospital after our embarrassing little false alarm. I think it was after midnight so that would have put us on Saturday, very, very early Saturday, October 25, 2008. It was so bitter cold outside. In only a short time, the weather went from a welcomed chilly nibble to a full chomp on our limbs. We were so tired. I was still a bit bewildered by Friday evenings tribulations and I was still mildly uncomfortable. To sleep we went. We awoke later that Saturday morning and began going about our day as usual. There was laundry to be done, dishes, an antsy dog to be played with, and contractions to be timed (Sara was persistent with this one). My contractions were still a good fifteen minutes apart, so we were on alert, but not overly anxious. We also had a Halloween party to attend that Saturday evening, so Ms. Graisyn would not possibly cause us to miss such festivities. And she didn't. We attended the Halloween party un-costumed, but ready to socialize with our friends. My contractions persisted the entire time, so we didn't stay long. In fact I think the fun times, for us anyway, lasted about two hours. Then, home we went to time more contractions and get some shut eye. I slept for two hours. By 12:30 a.m. Sunday morning, I was pacing the house like a horse in heat. I was uncomfortable, aggravated, and sweaty. Sara slept soundly as I traipsed the area around our bed and into the hallway outside our bedroom. I was certain that it was time. Our little Graisyn Quinn was ready to make her appearance into the world. I was, however, still embarassed enough by Friday's events to second guess myself. I let Sara sleep while I continued making trails around our house. Sara began to stir sometime around 1:30 a.m. She must have heard me panting with discomfort. Or maybe the sound of my plotting feet in and around our bedroom had finally been enough to wake her from her sleepiness. When she pulled herself fully from sleep mode, she asked me how long I had been awake and, more importantly, how far apart my contractions were. Oops. My bad. Seven to ten minutes apart I think. Wrong. Let's try three to five minutes apart. It was time to head to the hospital. It was almost 3:00 a.m. Sara was adamant that we leave right away. I was adamant that I take a shower first. Listen, a girl has to be clean for a day like this. I won. Shower first, then we leave. Sam and baby one. Sara zero. Sara and I arrived at the hospital at about 3:30 a.m. We entered through the E.R. and were escorted to the birthing unit. I was hooked up to monitors so that the nurses could be certain that it was actually time. "You're staying," they said. Sara went back to the truck to get our bags only because I made her leave them there for fear of being embarrassed all over again. They settled me into a birthing suite. When Sara got back with our bags, we settled in. We were given instruction to walk to help the labor progress. We walked. We walked and walked and walked. We traveled the birthing unit for more than three hours. We got to know it very, very well. Sara's parents, who received a premature phone call from her about the anticipation of our arrival, arrived at the hospital at 8:30 a.m. They were given strict instruction to wait down the hall so that I could manage the pain of my contractions. I was bedridden at this point and had opted for no pain management. That's right, the nurses never even started an I.V. on me. Mom and Dad in-law waited with anticipation down the hall. My labor was progressing really well. It was about 10 a.m. and my water still had not broken and I was still just under 8 cm dilated. The doctor came in to break my water. Sara and I heard him tell the nurses that he would break my water and then head to the sister hospital to do rounds there. Not a chance. He broke my water and within ten or fifteen minutes, for sure within the next two contractions, I had to push. I guess this in unheard of. Typically first time moms take a bit longer to deliver. Maybe I should have told everyone that I am traditionally atypical. Oh well. The nurse advised me to quit pushing. I advised her that was absolutely not a possibility. She checked and called the doctor back. Our baby, our Graisyn Quinn was on her way! The doctor was back in the room. He asked if he had time to put on scrubs. He didn't. He ripped off his sweater and threw it on the pull out sofa next to him. The nurses threw paper scrubs over his designer button down. I pushed for a total of fifteen to twenty minutes and Graisyn made her debut into the world. She was here all too quickly and managed to rip me pretty substantially, but she was here nonetheless. I held my screeching baby while Sara cut her cord and I got stitched up. Then she was taken for her weighing and cleaning. Grandma and Grandpa in-law came into the room as soon as they could. They fell in love with her as quickly as Sara and I had. I was exhausted, but with the visitors pre-birth and after birth, could not get my brain to settle down enough to sleep. The last of the visitors left, including Sara's parents, at 6:30 that evening. Finally it was our turn to get familiar with our new family. It was our turn to sleep. It was our turn to be with our baby. Our Graisyn Quinn had arrived. 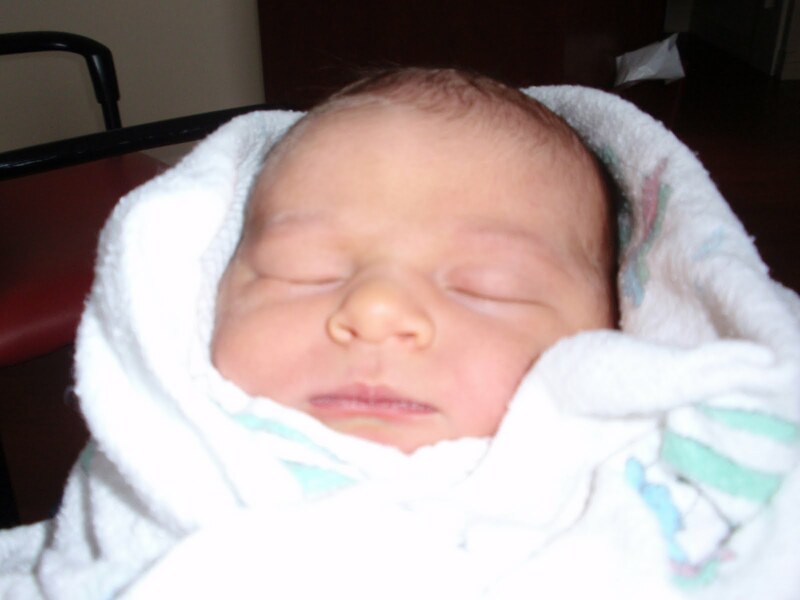 October 26, 2008, 10:36 a.m. 19.5" long and a comfortable 6lbs. 15oz. A realist. A little zany. Critical. Sarcastic. I need to work on my patience, but I have minimal tolerance for ignorance and stupidity. My wife says I have ADD, but I don't think so...what's that over there?! I run. I write. I cook. I play. I am in love with my family. (c)2011 Snip-its from a Lesbian Household. Ethereal theme. Theme images by merrymoonmary. Powered by Blogger.